Lindsay has until April 24th to file her intention to appeal with the Supreme Court so she can fight for her life. Help give her the chance. 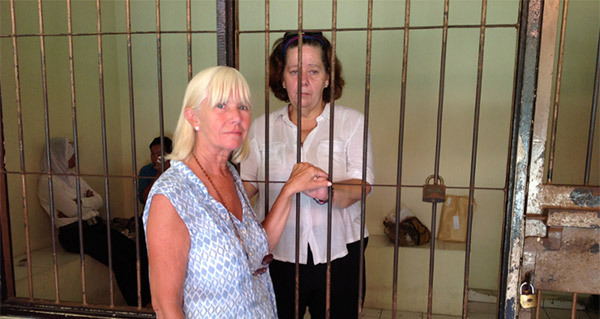 21 April, 2013 Lindsay Sandiford, who faces death by firing squad in Bali unless we can help her, has written a letter addressed to me and everyone else trying to help her. I share her letter with you. Donate now to give Lindsay the chance to fight for her life. Hi, this is Lindsay. I wanted to write to Aral and all the people who have donated towards my appeals against the death penalty. I can not thank you enough for your generosity and caring. I’ve always been an independent person and I hate not to be able to pay my way. So for me this is a very humbling experience having to rely on the kindness of strangers and am very deeply touched. I am trying to help myself. As you are probably aware, the government won’t assist despite pontificating that they are opposed to the death penalty. I knit and have just finished a piece that I’m hoping to auction to assist paying for my local lawyer and his assistants. They are really good people along with the enormous debt I owe to Reprieve for their support and simple caring. I know I have been difficult to deal with as the situation I am in leads to the ultimate emotional rollercoaster ride. They have been brilliant. Prisoners Abroad is a UK charity that has quietly supported me personally with funds for buying drinking water and food. I will never be able to express the joy they gave to me. The precious gift of a visit from my youngest son. Finally, thank you to my family, without whom I would have not had the will to carry on. The love I have received is beyond measure. I'm appealing first and foremost for someone I haven't met but so very much want to and want to get to know: my granddaughter who was born on the 1st of December, 2012. Thank you, thank you, thank you for your caring.